Ikal Angelei organized local people to fight the construction of the massive Gibe 3 Dam that would block access to water for indigenous communities around Lake Turkana. Located in East Africa’s Rift Valley, Lake Turkana, a World Heritage Site, is the largest desert lake in the world. An archeological site where some of the oldest human fossils have been found, the Lake Turkana Basin is home to large populations of crocodiles, hippos, snakes and fish. Its thriving ecosystem represents a lifeline to the hundreds of thousands of indigenous farmers, herders and fishermen who live around it. Over the past 40 years, climate change, irrigation projects and upstream dam projects have steadily lowered Lake Turkana’s water levels. As water becomes increasingly scarce, the residents near the Kenya and Ethiopia border who rely on the lake to support their livelihood have become desperate to provide for themselves and their families. Dwindling natural resources have increased competition for wood, animals and especially water between indigenous communities in Kenya and Ethiopia, resulting in armed raids and massacres in the Lake Turkana region. In 2006, Ethiopia began construction of the Gibe 3 Dam along the Omo River, the source of 90 percent of Lake Turkana’s water. Often compared to China’s Three Gorges, the Gibe 3 Dam, if completed, would be the largest hydroelectric plant in Africa, and the fourth largest in the world. The dam is expected to cause the lake’s water level to drop by as much as 23 to 33 feet within the first five years, depleting fish stocks and depriving communities of a critical source of potable water in this desert environment. Poverty and resource conflicts between communities are likely to increase as a result. Born in Kitale and raised in the violent region of the Lake Turkana Basin, Ikal Angelei was taught at a tender age to protect herself amid ethnic conflict between the indigenous communities of Kenya and Ethiopia. She was working at the Turkana Basin Institute, an anthropology research center, when she heard from research scientists about construction of the massive dam—and immediately felt a responsibility to stop it. Outraged at the fact that plans were moving forward without any consultation from local communities, she founded the group Friends of Lake Turkana (FoLT) in 2008. Angelei follows in the footsteps of her father, a distinguished member of the Kenyan Parliament who opposed the construction of Turkwell Dam in the 1980s and 90s. She has also been compared to Nobel laureate and Goldman Prize winner Wangari Maathai because of their shared belief that education of local communities lies at the center of their fight to protect the environment and secure a brighter future for themselves. Angelei brought together Lake Turkana’s divided and marginalized indigenous communities to fight against the mounting environmental and social implications of the Gibe 3 Dam. She informed elders, chiefs and opinion leaders—all of whom had not heard about the dam—about the project and its implications. 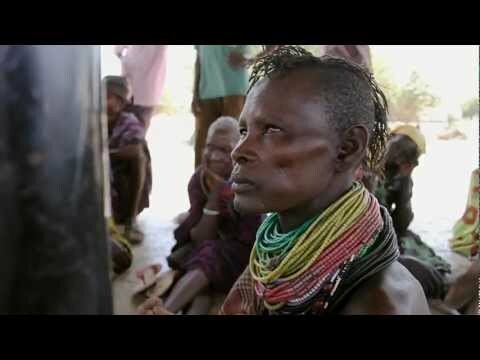 In February 2009, local tribes issued a “Lake Turkana People’s Declaration” stating that they had given FoLT the mandate to communicate their grievances regarding the dam. Angelei took their voices to local members of parliament and the Ministries of Environment, Energy, Water and Irrigation and Fisheries, urging them to reconsider Kenya’s power-purchasing deal with Ethiopia. 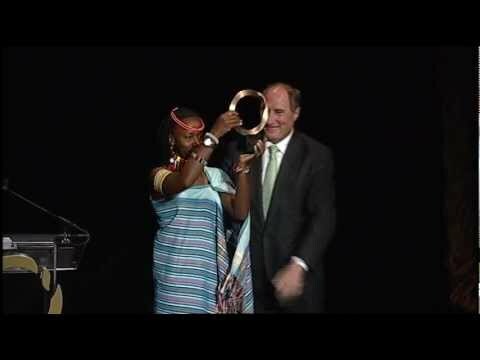 In response to Angelei’s advocacy, in August 2011, the Kenyan Parliament passed a unanimous resolution for the Kenyan government to demand an independent environmental assessment from Ethiopia. UNESCO’s World Heritage Committee also responded to her appeals by passing a resolution to halt dam construction until further investigation. Most impressive of all, Angelei successfully convinced major banks, including the World Bank, the European Investment Bank and the African Development Bank, to withdraw their considerations for financing of the Gibe 3 Dam. Currently, the Gibe 3 Dam is 40 percent complete as the Ethiopian government is struggling to secure additional funding. Angelei is working to ensure Kenya complies with the resolution passed by Parliament. If Kenya pulls out of its agreement with Ethiopia to purchase one-third of the electricity, it would jeopardize future funding for the project as China, the last big investor, would not be able to justify its investment with such diminished demand. October is Film Festival Month!